Jessi Spike Gravelle began her music studies at the age of four, in Chesaning, Michigan. Her many years of private study, various competitions and performance experience gained her admittance to Michigan State University's piano pedagogy and performance departments, where she studied with Ms. Yong Hi Moon. After transferring to UCLA as a music major in 1990 to study with Dr. Ick Choo Moon, Jessi continued her work in piano pedagogy by opening her own private teaching studio in Santa Monica. As her studio continued to grow, Jessi also earned her Master of Arts (M.A.) degree in English from California State University, Northridge in 1996. She is employed by the Santa Monica Malibu School District (SMMUSD) as an elementary instrumental and choral music teacher. A native of Rio de Janeiro, Brazil, violinist Manoela Wunder has established herself in Los Angeles as a versatile and eclectic artist. 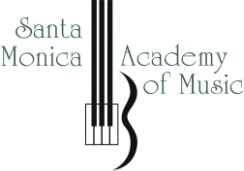 Classically trained, she has a strong passion for improvisation in jazz, blues, and rock genres and is an active composer and arranger for string ensembles and jazz bands. She founded an electric rock string quartet, the Electric Angels, and has a jazz group “The Wunder Trio”, she performs as well as a guest violinist with local act “New Sensations” and the international world music band “Esperanto”. Manoela has been featured in films and TV shows such as Suburgatory (ABC), Qwerty, Spaghetti Storm, The Composer, and The Monstrosity. Manoela has performed with a wide range of orchestras and chamber groups in New York, Chicago, Miami, and Los Angeles as well as Europe. Her music has been heard in the Alice Tully Hall (NY), Symphony Center Chicago and Walt Disney Concert Hall (LA). She is a multiple prizewinner of competitions in the United States and Europe and has been a guest at many prominent festivals throughout her career. Manoela holds a Bachelor of Music from the Aaron Copland School of Music at Queens College (NY) in Violin Performance and a Master of Music degree with distinction under scholarship from DePaul University in Chicago. Ms. Wunder has been an avid educator in a variety of instruments for many years. Since moving to Los Angeles, she has taught for several private music schools as well as public elementary and middle school classes and orchestras. See manoelawunder.com for more information about her professional activities. Sandra Pehrsson: voice and piano. With 18 years of experience as a voice and piano teacher, Sandra Pehrsson is dedicated to help her students to develop their musical talent and voice to build their confidence within themselves. With voice and piano as her main fields of study, she also studied composition, music theory, conducting, music history, band leading, microphone technique, performance, and multiple wind, string and percussion instruments. 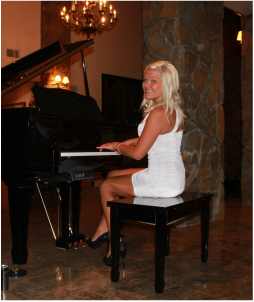 She is trained in classical, pop, jazz and rock genres, and teaches all genres. Originally from Sweden, she attended the Uddevall School of Music, Helsingborg’s School of Music, and Sungsgarden’s Folkhogskola. All of this culminated at the prestigeous Leeds College of Music in the United Kingdom, where she received her Diploma of Higher Education in Jazz and Contemporary Music, with an emphasis on voice and piano where she was a recipient of Leeds “Best Jazz Singer" award. In addition to teaching, Sandra performs regularly and works as a professional singer, singer/songwriter and pianist. She has performed around the UK, Sweden and the US. She is one-half of the upcoming singer/songwriter duo SandraKota, while also working in former Tower of Power singer Lenny Goldsmith’s band The New Old, as well as singing lead soprano in the six-part a cappella group Swing Shift. Sandra is also part of Goldie Gillespie’s funky Rick James tribute band and she has for many years worked as a jazz singer/pianist. As a session singer, Sandra has, amongst other things, worked on an album released by Columbia Records.